I found this recipe on www.chow.com - my new favourite place for Gluten free recipes. Just search 'Gluten Free' under recipes and you get loads of hits. Some of the ingredients and instructions in this recipe where aimed towards Americans so I have made a couple of amendments. Cream cheese for the topping! Using a mixer, combine eggs, sugar, butter, salt, cinnamon, vanilla. Slowly add sifted coconut flour and baking soda. Pulse raisins and walnuts in food process or until coarsely ground. 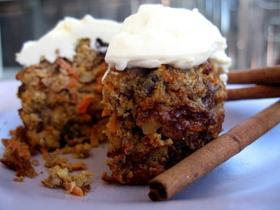 Fold in carrots, raisins, and walnuts into mixture. Note: Use muffin liners since these are notorious for sticking to the bottom no matter how much you oil and flour them. I haven't made this yet, nor have I seen coconut flour for sale so I will investigate and report back soon! When you state 'vanilla', is this vanilla sugar or vanilla flavouring, or essence, or something completely different?